Upcoming ambient intelligence environments will boast ever larger number of sensor nodes readily available on body, in objects, and in the user's surroundings. We envision "Pervasive Apps", user-centric activity-aware pervasive computing applications. They use available sensors for activity recognition. They are downloadable from application repositories, much like current Apps for mobile phones. A key challenge is to provide Pervasive Apps in open-ended environments where resource availability cannot be predicted. We therefore introduce Titan, a service-oriented framework supporting design, development, deployment, and execution of activity-aware Pervasive Apps. With Titan, mobile devices inquire surrounding nodes about available services. Internet-based application repositories compose applications based on available services as a service graph. The mobile device maps the service graph to Titan Nodes. The execution of the service graph is distributed and can be remapped at run time upon changing resource availability. The framework is geared to streaming data processing and machine learning, which is key for activity recognition. We demonstrate Titan in a pervasive gaming application involving smart dice and a sensorized wristband. We comparatively present the implementation cost and performance and discuss how novel machine learning methodologies may enhance the flexibility of the mapping of service graphs to opportunistically available nodes. The famous "AppStores" are common nowadays to publish software (Apps) onto mobile phones. We envision that a similar development of "Pervasive AppStores" will commoditize the so-called Pervasive Apps. This work proposes a way to realize this idea. We present Titan, a service-oriented solution that comprises Internet application repositories storing applications in the form of dynamically composed service graphs, a mobile device managing the user's Personal Area Network (PAN), and a service graph execution framework distributing service execution to available resources (sensors, mobile devices) in the user's PAN. We focus on activity-aware applications, applications that use the physical activity of the user as a contextual source to provide an adapted pervasive computing experience, sometimes also called activity-aware computing . For illustration purposes, a typical use case has the user query the system as to what Pervasive Apps are available for him. The system, based on the available resources in the PAN, returns a list of available applications. Finally, once the user downloads one of the activity-aware Pervasive Apps, this one will recruit the necessary resources and deliver a new kind of experience in everyday environments. For instance, a Pervasive App could suddenly enhance a traditional dice game by real-time strategic information delivered to the user triggered by his gestures and game state. Another application may turn a fitness parkour into an interactive social challenge by comparing the user's style and performance to other sport enthusiasts around the world. However, the real power will come from the democratization of activity-aware Pervasive Apps, which will lead to new creative use of the resources available within the user's PAN. In order to infer the user's activities, various sensors on the user's body, in objects the user interacts with, and in the close surrounding of the user provide data which is classified among a set of predefined activities, typically with machine learning techniques . A typical sensor modality is accelerometers, but other modalities can be used for activity recognition, such as muscle activity sensing, microphones, or reed switches (see  for an exhaustive list). These sensors are interconnected into a PAN. Typical activity recognition algorithms include the steps of signal preprocessing, data segmentation, feature extraction to reduce data dimensionality, and classification of the features in a set of predefined output classes (see Figure 2). This model is the one that is assumed in this work as it has been widely applied in human activity recognition in wearable computing (see, e.g., [4–7]). This work makes two assumptions. (i) Availability of Resources. Future environments will see an ever larger availability of readily deployed sensors. These sensors will be either specifically dedicated to activity recognition, or they will be foreseen for other uses yet can be repurposed for activity recognition (e.g., proximity infrared sensors are typically used to turn on lighting automatically but can be repurposed to detect static postures from dynamic movement ). Deployment vectors for sensors include, for example, textile-integrated sensors included in garments  (sensors are already commercially available in some sports shoes), sensors available in mobile phones, in toys, and in building automation systems (e.g., to detect door/windows being opened or closed). Continuous technological advances further support this ever increasing availability . (ii) Opportunistic Sensor Configurations. While some sensors may be known to be available (e.g., integrated in all clothings in the same location and with the same characteristics across all brands), it is much more likely that in a real-world deployment of activity-aware systems the nature, type, and availability of sensors will be highly dynamic and hard to predict. This will depend on the clothes that the user wears (different clothes may offer different sensors), the sensorized gadgets that the user takes with him or leaves behind (e.g., mobile phone, hearing instrument, PDA, and sensorized watch), and his location and surroundings. Typically, different rooms will offer different sensing capabilities. For instance, a conference room may be equipped with cameras for video conferencing; manufacturing environments may be equipped with presence sensors to shut down machinery in case of danger, while a bed may measure the user's heart rate during sleep. Such environments are open ended as they change over time through upgrades in unpredictable ways. However, activity-aware applications ought to make best use of the resources available at run time, rather than demanding a specific sensor configuration which may be cumbersome and impractical for the user to replicate day after day (e.g., placing a sensor at ever the same on-body location). We refer to such environments as offering opportunistic sensor configurations. Ongoing research efforts deliver machine learning tools supporting activity recognition in such opportunistic sensor configurations [3, 11]. The main challenges that arise for the "Pervasive Apps" concept are as follows. (i) Open-Ended Environments. Devices found in open-ended environment may be built by various manufacturers, using diverse operating systems, have various capabilities, and be available in various numbers and types. This availability is hard to predict and may change over time. (ii) Just-in-Time Application Adaptation. A consequence from the above is that various available resources lead to different activity recognition capabilities and thus allow different kind of Apps. The Pervasive Apps that are offered must be a function of the available resources. Furthermore, some components of the App may need just-in-time adaptation; one sensor and the corresponding machine learning elements may not be available, yet thay can be substituted by one or more other modalities. Recent results show that this type of abstract feature transformations is not uncommon . (iii) Distributed Processing and Efficient Resource Usage. Sensor nodes only provide limited processing resources, power, and communication bandwidth that must be managed efficiently. Distributing activity recognition processing on the sensor nodes allows to decrease the amount of data transferred and to best exploit the available resources. Consequently, the running applications also need to be dynamically relocated when the the available resources change. (iv) Ease of Application Representation. The Apps should be represented in a way that allows abstracting from the specific availability of resources at run time in a way that allows operation with various combinations and substitutions of run time available resources. (v) Scalability. In open-ended environments, new application concepts may emerge. A current example is the repurposing of existing resources in urban sensing for new initially unforeseen applications , and similar transformations must not be excluded in the future. Thus, the system must allow for some flexibility in the application logic. In this paper, we present the following. A review of related work (Section 2). We describe Titan, an integrated solution for creating activity-aware Pervasive Apps (Section 3). Titan is a framework that uses interconnected services (service graphs) as a programming abstraction. It links smart sensor nodes together to collaboratively recognize a user's activities and realize Pervasive Apps. Titan thus realizes distributed service execution on multiple nodes in a programmer-transparent way. It allows dynamic remapping of service graphs, when resource availability change, and service graph replacement at run-time. We characterize the system in a gaming Pervasive App (Section 4). This application is a pervasive Farkle game (a form of dice game) that is enhanced by activity recognition. This application involves all the aspects of Titan. We characterize Titan in terms of comparative resource usage and performance. We discuss the challenges involved in executing activity recognition service graphs in environments where the availability of sensors cannot be guaranteed. We discuss how recent machine learning methodologies geared at activity recognition in opportunistic sensor configurations can be combined with Titan and provide it with a greater flexibility in mapping service graphs to available resources (Section 5). 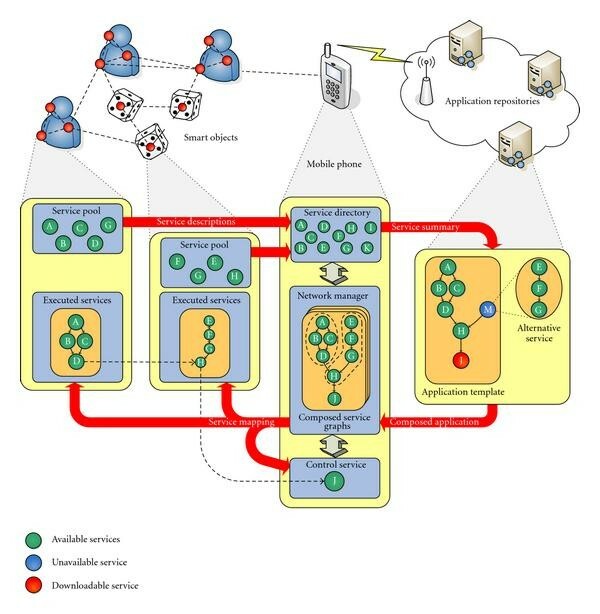 An analysis of context recognition methods based on body-worn and environmental sensors was carried out in  and favors a streaming processing approach realized by an interconnection of tasks. This has led to the development of the Context Recognition Network . This toolbox allows the realization of activity recognition algorithms by interconnecting signal processing elements using a simple scripting language. This system, however, assumes a static availability of sensors and only allows centralized data processing. An approach to dynamic reconfiguration of data processing networks on sensor networks is DFuse . DFuse is a service-oriented approach to data processing. It contains a data processing layer that can fuse data while moving through the network. To optimize the efficiency, the data processing tasks can be moved from one node to another. DFuse is targeted at devices with typically higher processing capabilities than most sensor nodes provide. Other service-oriented approaches include TinySOA , that allows to split queries into service invocations and distributively solves them, and Tenet , which allows to task individual sensor nodes but allows only communication in a vertical hierarchy. The Abstract Task Graph (ATaG)  with its DART runtime system  allows to execute task graphs in a distributed manner. The task graph is compiled during runtime and adapted to the configuration of the network. DART also imposes high requirements on the hardware. In our own prior work, we envisioned a lightweight engine for the execution of streaming data processing task graphs on sensor nodes . This evolved into the Titan nodes described in Section 3.2, which is one element of the complete Titan framework presented here for the first time to realize Pervasive Apps. Dynamic reconfigurability was investigated by providing dynamic loading of code updates in Deluge , TinyCubus , SOS , or . Dynamic code updates rely on homogeneous platforms (i.e., the same hardware and OS), which is unlikely to be the case in open-ended environments. In addition, dynamic code loading is time consuming and requires the node to stop operating while the code is uploaded. A platform-independent approach is to use a virtual machine like Maté . Applications running in Maté use instructions that are interpreted by virtual processors programmed onto network nodes. The performance penalty of the interpretation of the instructions can be alleviated by adding application-specific instructions to the virtual machine . These instructions implement functionality that is often used by the application and execute more efficiently. A number of frameworks use a mobile phone as the core of the system with nodes connected with 1 hop and a star topology to the phone. BeTelGeuse (gathering and processing situational data) is a framework geared mostly at data acquisition from on-body sensors . The SPINE (signal processing in node environment) framework goes beyond by allowing the rapid prototyping of activity-aware application on the mobile phone using the data from motion sensors distributed on the body . SPINE centralizes the data processing on the phone and is well suited to environments where a design-time-defined set of sensors are available. It does not, however, allow the run-time instantiation of Pervasive Apps according to the run time discovered resources, as we envision here. The SENSEI framework aims to bridge the gap between the physical world and the future Internet and foresees a service-oriented approach to query a wide range of physical device services through Internet . This framework at this stage focuses on infrastructure and more abstract interoperability aspects, rather than on the specifics of Pervasive activity-aware Apps as envisioned here. There may eventually be a technical convergence with our approach although the concepts of Pervasive Apps are unique to our work so far. The opportunity framework  aims at supporting activity recognition in opportunistic sensor configurations—sensors which just happen to be discovered and whose availability and kind cannot be controlled . The framework currently envisions a semantic matching of the resources to the activities to detect, and a utility-driven planning for the runtime composition of sensors and signal processing and machine learning elements. It is geared to allow the integration of machine learning methodologies developed for activity recognition in "opportunistic" sensor configurations (see  for a summary of recently developed machine learning techniques in this direction). Again, that work does not envision Pervasive Apps as introduced in this paper. However, that work underlines that there is a raising number of machine learning methodologies available to perform activity recognition even if the availability of sensors cannot be defined at design time. These methodologies in turn support and may be included within the framework introduced in this paper, especially to enable dynamic composition and substitution of resources. The recent development of opportunistic sensing  has led to other frameworks supporting urban sensing, participatory sensing, and crowd sourcing [13, 33–36]. Overall, existing related works do not address the idea of deploying Pervasive Apps much in the same way that currently Apps for mobile phones can be downloaded from various AppStores. However, these related works support our efforts. The SENSEI framework shows that there is ongoing effort to the inclusion of physical devices in a unified infrastructure, which also benefits our work. SPINE shows that using mobile device as the main point of a user-centric experience is a valid approach. The opportunity framework shows that a number of machine learning techniques are being developed to support the efficient use of unpredictably available run-time resources for activity recognition. Work in dynamic reprogramming, virtual machines, and task-based streaming data processing led us to select an appropriate abstraction level for the Titan framework, where we avoid the too low-level (and hence slow) binary reprogramming in favor of a higher level representation of activity recognition as a set of interconnected tasks performing functions of signal processing and machine learning. To our knowledge, the introduction of the concept of Pervasive Apps, downloadable to the user's mobile phone and running using the available sensor nodes in the user's PAN, together with the supporting implementation, is a specificity of our work. The Titan framework for pervasive applications is shown in Figure 1 and has the following three components. The Titan framework for pervasive applications comprises tiny tasks running on Titan nodes in the PAN (left), a mobile device (center) and Internet application repositories (right). The network manager on the mobile phone collects device and service information available in the PAN in its service directory. It provides this information to application repositories on the Internet. These repositories compose possible applications at runtime and send the resulting service graphs back to the network manager, which maps the services onto individual nodes for execution. Illustration of a service graph doing "drink detection" from a Titan node placed on a cup and one placed on the wrist. The service graph is illustrated, together with one particular runtime instantiation of the graph on the sensor network. (i) Mobile Device. A mobile device (typically the user's mobile phone, but it could also be another kind of wearable computer) acts as the central point of the system and the interface with the user. The mobile device discovers available resources in the user's PAN. The user can then query available Pervasive Apps that can be offered with the available resources. The mobile device offers interaction possibilities with the user. It is also one instance of a Titan node (see below) and can similarly execute services (typically those requiring higher computational capabilities than what is available on a sensor node). In addition, it allows for dynamic service download (in the form of Java code). Such services typically form the core logic of the Pervasive Apps. (ii) Internet Application Repositories. Application templates are hosted on Internet application repositories. They are represented by a set of interconnected services, which are required to be present in the user's PAN for the application to function. Substitution between services as well as alternative implementations are also provided to best exploit available resources. The composition of the effective service graph to instantiate is also carried by the Internet application repositories according to available resources. (iii) Titan Nodes. This is the sensor networking part of Titan. It consists of firmware on the sensor nodes of the network. It allows the instantiation, reconfiguration, and execution of interconnected services on the sensor nodes, together with the communication in the network and with the mobile device. It essentially realizes the distributed execution of activity recognition algorithms represented as interconnected services in the PAN of the user. It is built upon TinyOS—a common sensor network operating system. The process of finding suitable Pervasive Apps is shown in Figure 1. The top part shows the PAN of the user and the Titan nodes (in objects or on the body). The mobile phone runs a service directory, which acts as a database for the services available in the service pools of the Titan Nodes. Upon querying an application, the service directory's content is sent to application servers on the Internet to determine possible applications for the given PAN configuration. Typically, services offered by sensor nodes are in relation to the typical use of the elements in which they are embedded. However, it is important to note that custom Titan Nodes can be programmed (statically) with custom sets of services and these services may be of various complexity. Figure 2 is an example, where nodes 1 and 2 contain sensors. Node 1 is a motion sensor placed on the wrist. It provides services delivering low-level information (raw acceleration). A typical activity recognition chain consists of sensor data acquisition, segmentation, feature extraction, and classification. Here, node 1 has been instructed to execute a service subgraph that splits the sensor data in windows, computes mean and standard deviation features, and locally classifies these features to indicate whether the gesture correspond to a movement of the hand going to the mouth. Node 2 on the other hand is a smart cup that provides a manufacturer-supplied high-level service that directly delivers detected activities, such that the cup is tilted. Here, no other services are used internally within the node because a specific sensor (e.g., a tilt sensor) delivers readily usable information. Node 3 is only capable of processing. It receives data across the network from the first two nodes and does decision fusion by correlating movements of the wrist with the tilting of the cup to detect that the user's gesture corresponds to drinking from the cup. The communication between services within a node or across nodes is handled transparently by Titan and is hidden from the programmer. While in this work we describe sensor nodes programmed with general purpose services composed to the application scenario's needs, we envision in a future perspective that some services in sensor nodes will be provided by manufacturers of components of ambient intelligence environments. Titan defines a programming model where applications, such as activity recognition applications, are described by an interconnected service graph. We refer to Titan Nodes as the nodes of the wireless sensor network that contain the Titan firmware, built on TinyOS . The Titan nodes form the sensor networking component of the Titan framework. They allow the run-time instantiation of distributed applications represented as service graphs. Each Titan node typically executes a subgraph of the entire service graph making up the application. The architecture of the Titan nodes is shown in Figure 3, and its elements are as follows. Main modules of the Titan Nodes (right). The arrows indicate in which direction functions can be called. The network manager in the mobile device can control the instantiation of service graphs by communicating with the Service Manager of the Titan Node. 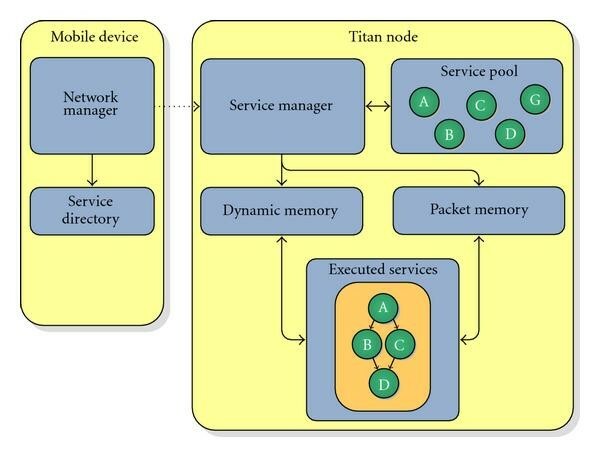 Titan nodes provide a set of services stored within a service pool. Services can implement signal processing function, classification tasks, sensor readout, or other kinds of processing. Not all Titan nodes implement the same kinds of services. For instance, nodes that do not contain sensors would not offer sensor readout services, while nodes with higher computational capability may offer more computationally intensive services. Services are flashed into the Titan nodes at design time. Services have a set of input ports, from which they read data, process it, and deliver it to a set of output ports. Connections deliver data from a service output port to a service input port and store the data as packets in FIFO queues. The services go through the following phases when they are used. (1) Configuration. At this point, the service manager instantiates a service. To each service, it passes configuration data, which adapts the service to application needs. Configuration data may include, for example, sampling frequency and window size in signal processing services. The service can allocate dynamic memory to store state information. (2) Runtime. Every time a service receives a packet, a callback function is executed to process the data. Titan provides the service with the state information it has set up during the configuration time. Services are executed in the sequence they receive a packet, and each service runs to completion before the next service can start. (3) Shutdown. This phase is executed when the service subgraph is terminated on the node. All services have to free the resources they have reserved. The service manager is the system allowing to reconfigure a Titan node. It instantiates the executed services according to the network manager's requests (see Section 3.3). The service manager is responsible for reorganizing the service subgraph executed on the local sensor node during a reconfiguration. The dynamic memory module allows services to be instantiated multiple times, and reduces static memory requirements of the implementation. The services can allocate memory in this space for their individual state information. This module is needed as TinyOS does not have an own dynamic memory management. The Packet Memory module stores the packets used by the services to communicate with each other. The packets are organized in FIFO queues, from which services can allocate packets before sending them. This data space is shared among the services. Packets exchanged between the services carry a timestamp and information of the data length and type they contain. Services reading the packets can decide on what to do with different data types. If unknown data types are received, they may issue an error to the service manager, which may forward it to the network manager to take appropriate actions. To send a packet from one Titan Node to another, Titan provides a communication service, which can be instantiated on both network nodes to transmit packets over a wireless link protocol as shown in Figure 4. During configuration time, the communication service is told which one of its input ports is connected to which output port of the receiving service on the other node. The two communication services ensure a reliable transmission of the packet data. The communication service is automatically instantiated by the network manager to distribute a service graph over multiple sensor nodes. Thus, for the programmer, there is no distinction when a service graph is mapped on one or more Titan nodes. 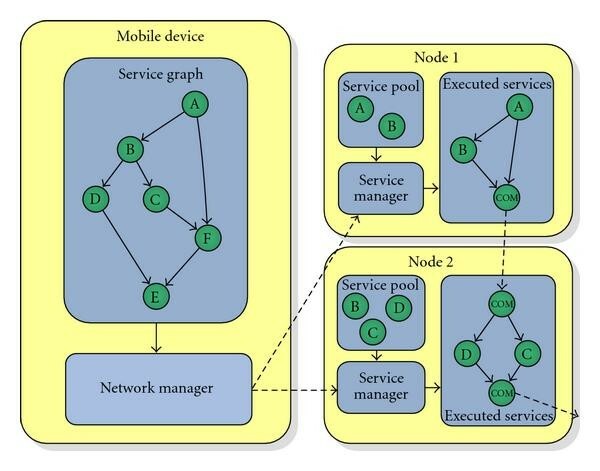 Mapping of a service graph (whose definition resides in the mobile device) onto the Titan nodes. Parts of the service graph are configured onto each participating node, depending on their sensors or computational capabilities. Interconnections across sensor nodes are realized over automatically inserted communication services. The recommended maximum size of a packet for Titan Nodes is 24 bytes, as it can easily be fitted with 5 bytes header into a TinyOS active message. The active message is used to transmit data over wireless links and offers 29 bytes of payload. A programmer designs his application by interconnecting services in the form a service graph. Service parameters as well as location constraints can also be defined. The mapping of a service graph into executed services is controlled by the network manager. In order to support the network manager, the Titan nodes answer to broadcast service discovery messages originating from the network manager by providing a list of matching services available in the service pool and by providing status information about the node. The network manager then decides on a partitioning of the full service graph realizing the application and provides the service manager of the Titan nodes with the specific subsets of the service graph to instantiate. When data needs to be exchanged across nodes, communication services (see Section 3.2.5) are automatically inserted. The resulting service subgraphs containing the services to be executed on every sensor node are then send to each participating node's service manager, which takes care of the local instantiation as shown in Figure 4. After the configuration has been issued, the network manager keeps polling the Service managers about their state and changes the network configuration if needed. On node failures, the network manager recomputes a working configuration and updates the subgraphs on individual sensor nodes where changes need to be made, resulting in a dynamic reorganization of the network as a whole. When sensors are sampled at two sensor nodes and their data is delivered to a third node for processing, the data streams may not be synchronized due to differing processing and communication delays in the data path. As a consequence, a single event measured at the two nodes can be mistaken for two. If the two sensor nodes are synchronized by a timing synchronization protocol, a timestamp can be added to the data packet when it is measured. The data streams can then be synchronized by matching incoming packets with corresponding timestamps. Timing protocols have been implemented on TinyOS with an accuracy of a few 10  [38, 39]. If the two sensor nodes are not synchronized, the sensor data can be examined as in . The idea is to wait until an event occurs that all sensors can measure, for example, a jump for accelerometers on the body. Subsequent packets reference their timestamp to the last occurrence of the event. This functionality is provided in the Synchronizer service. The mobile device is the interface between the user, the sensor network, and the Internet application repositories. The mobile device contains a network manager that controls the mapping and execution of the service graph on the Titan nodes, a service directory that contains a list of all available services discovered in the PAN, and a set of service graphs (representing various applications) waiting to be mapped to the sensor network. In addition, it can execute custom application logic services downloaded from the Internet application repositories, in the form of Java code. When the execution of a specific service graph is requested, the network manager first inspects the capabilities of the sensor nodes in the environment by broadcasting a service discovery message containing a list of services to be found. Every node within a certain hop-count responds with the matching services it has in its service pool. From this information, the network manager builds the service directory. The network manager then optimizes service allocation such that the overall energy consumption is minimized. For this purpose, it uses a metric summing up the main energy consumers, namely wireless communication, sensors and actuators, and the processing resources needed. The result of this allocation is communicated to the service manager of the concerned Titan nodes in the form of service subgraphs. Each node typically receives a subset of the overall service graph, thereby leading to a distributed execution of the entire service graph on multiple Titan nodes. The Service Manager on the Titan Nodes then takes care of the service instantiation and that the data generated by one service is delivered to the next service according to the specification of the service graph. This occurs transparently, such that individual services are not aware of whether the next service is executed locally or whether the data first has to be transmitted to another sensor node. Titan nodes can also invoke at run time the network manager to ask for reconfiguration (e.g., if battery runs low). During the execution of the service graph, the network manager monitors the network via the service manager on the Titan nodes to determine whether problems occur. In case a node fails, a new mapping of the service graph can be issued. The task of the network manager is formally described as to map a service graph , where is the set of services, and ,  is the interconnections between them, onto a network graph . The network graph is described by a set of nodes and communication links , . The network manager's goal is to find a mapping , such that a given cost function is minimized. Various cost functions targeting different tradeoffs have been proposed for such a task, such as the minimization of transmission cost, total energy consumed, or the maximization network lifetime . We use here a metric targeting minimization of the total energy used in the network. The cost function makes use of a model of the sensor node using values stemming from benchmarking the Titan implementation on real sensor nodes (see Section 4 and ) with a TI MSP430 microcontroller and a CC2420 transceiver. The metric used for the evaluation relies on three main cost functions. (i) Processing Cost . The cost of processing service on node . This cost results into a measure for whether enough CPU cycles are available to execute all services of the subset assigned to the given node. To achieve an energy value, the time for processing on the nodes' microcontroller is determined and multiplied by the power consumption difference from active to standby mode. (ii) Sensor Cost . The cost of using sensor required by service on node to collect data for the algorithm. As sensors can usually be turned off when not sampling, this cost value describes the additional energy dissipated on the node while sampling and includes possible duty cycling. (iii) Communication Cost . The cost of communicating data from one service to another for the node . The communication cost is zero for two services communicating within the same node. For external communication, it prioritizes intracluster communication and introduces penalties for cross-cluster communication. The cost is determined per message and includes energy dissipated at the sending and receiving part. Each interconnection is mapped to an edge and added to two sets as outgoing and incoming connections. Failure in meeting the constraints results in the service graph not being implementable. In such a case, the execution cost will be set to infinity. The costs introduced above depend on the device type to which they apply. The parameters for the device model and service models are sent to the service directory along with the node address upon service discovery. The service model in particular includes a mapping to determine the output data rate given a certain input data rate and the service parameters in the service graph description. When determining execution cost, the network manager first derives an estimation of the data communicated from service to service by propagating the data rates generated from each service to each successor. The individual cost functions make use of the service models and device models to produce the total mapping cost. The contributions of the individual cost components vary with the application that is executed and the network it is running on. Typically, communication costs dominate, as for the energy of sending 1 bit over the air, a microcontroller can perform roughly 1000 instructions  for the same energy. Sensor costs on the other hand are usually constant as long as the actually used sensors have similar energy consumption per sample. The mapping thus tries to keep communication intensive connections between services on a single node. In most application, this means to draw as much processing as possible to the data source, as processing in most cases reduces the communication rate. In the case of activity recognition algorithms, this means that the processing such as data filtering and feature extraction is preferably run on the Titan node containing the sensors. An exhaustive search of the best mapping is intractable for service graphs and networks of moderate size, as the search space grows with (see ). Therefore, we use a genetic algorithm (GA) to optimize the mapping, as GAs are known to provide robust optimization tools for complex search spaces . The GA parameters are selected in order to favor convergence to the global maximum by selecting a large population size, avoiding premature convergence, and by performing several runs. The resulting performance is the maximum of the performance obtained in each runs. The service graph is encoded for the GA as chromosome with genes, one for every service in the service graph. Each gene contains the set of nodes in the network providing the corresponding service. Mutations are applied by moving services from one node to another. Crossovers arbitrarily select two chromosomes, randomly pick a gene, and swap the gene and all its successors between the two chromosomes, which are then added to the population. The fitness of the chromosomes is evaluated using the cost metric given above. Once the implementation of the service graph with the lowest cost has been found, the service graph subsets are sent to the individual network manager of the Titan nodes for execution. Additional aspects related to modeling and convergence speed are discussed in . The logic of Pervasive Apps is likely unique to each application. Thus, it does not lend itself to be realized by generic services, such as the ones provided by Titan nodes. In order to enable for a large variety of Pervasive Apps, Titan allows for application repositories to download application-specific services to the mobile device, in the form of Java code (this is the "control service" in Figure 1). This Java code can access to all the features of the mobile device (usually a mobile phone), such as screen, touch input, audio output. In other respects, the downloaded Java services follow the same service model as the Titan nodes and can interact with them. Thus, the service running on the mobile device forms part of the service graph describing the application, exactly like any other sensor node. In particular, the Java services have access to packet communication methods to exchange data with the other services running on the Titan nodes. Since the Titan nodes use an 802.15.4 radio, we have built a custom Bluetooth to 802.15.4 gateway to allow communication between the mobile device and the Titan nodes. The Java service thus communicates over Bluetooth to the gateway, and the gateway relays the data to the 802.15.4 interface. The Titan network manager additionally provides a Java API that can be used by the Pervasive App to dynamically reconfigure the network with new service graphs. This allows tailoring the processing to the current Pervasive App state and turning unneeded sensors to low-power states. Upon query by the user for available Pervasive Apps, the mobile device transfers the content of the available services in the user's PAN (i.e., the service directory) to the Internet application repository. The Internet application server then returns the applications that are possible given the available services and composes at run time the service graph to be effectively executed. The application servers are databases storing application templates as service graphs. These templates use services that may or may not exist in the PAN. Each individual service in the application template may have multiple, functionally equivalent implementation possibilities involving one or more services. For instance, if a sensor node is not capable of executing an FFT, features such as zero crossings and amplitude range might be used instead. At runtime, the application servers use service composition algorithms to create a feasible application by combining libraries of template service graphs in their database. An efficient implementation has been shown in . Figure 1 shows one example application template containing a service M, which is not available in the PAN. Consequently, it is replaced by a functionally equivalent service graph containing the services E, F, and G, which are all available in the service pool of the smart dice. Another way for replacements to be possible is to allow the addition of new services to the service pool at runtime, for example, by means of wireless reprogramming or virtual machines. In this case, the application server may offer to download a particular service rather than compose its alternatives. This feature is especially useful for application-specific services which are not easily modeled by generalized services. This is usually the case for the main application logic. We use this approach in Section 4 to download a specific Java monitoring service to the mobile phone. A composed application consists of one or more service graphs and a control service (application logic). The control service runs on the mobile device and instructs the network manager when to exchange the service graph currently executed in the PAN for another one. Using multiple service graphs in an application allows restricting the processing to only what is needed in the moment and turning sensor nodes that do not participate into power save mode until they are needed again. We base the system evaluation on an exemplary activity-aware application: a pervasive Farkle game: A number of children meet on the schoolyard and decide they want to play a game with smart objects surrounding them and their on-body sensors. The children discuss different possible games but do not come up with one they all like and decide to consult their mobile phones to ask it for game suggestions. The mobile phone contacts an application server on the Internet, describes the smart objects in its environment, and asks for suggestions for applications in the category "Games." The server finds that there are six smart dice lying on the ground, and that all children are wearing wristbands with acceleration sensors. It therefore proposes to play "Yahtzee" or "Farkle," two dice games played with five and six dice. The children download the Farkle application to their mobile phone, which then configures the environment for the game. During the course of the game, the smart dice recognize how they are manipulated during each throw. Namely, they detect being picked up, shaken, and thrown together with data from on-body sensors to identify which objects are held by whom. Then they communicate their eye count when they lie still. By correlating their movements with the other dice and the sensor-enabled wristband of the player, the smart dice can identify the player using them, thus enabling multiple players to play the game simultaneously. The game state is monitored by the mobile phone. It receives the actions from the dice, keeps the score, and tells the players whose turn it is next. As it is the first time they play the game, suggestions on strategy or rule explanations are delivered just when they are useful. The scores as well as the current throw state are displayed on the device's screen as shown in Figure 5. Thus, except for the selection of the game, all interactions with the technology occur naturally with physical objects. Two children wearing wristbands (a) playing the dice game with the smart dice (b). The game score is automatically updated on the mobile phone's screen (c). Titan nodes with accelerometers are worn on the wrist (a) and integrated in the dice (b). The game presented here could be realized by transmitting all data sensed by the smart objects to the mobile phone and processing it centrally. However, this would produce an unnecessary high load on the wireless network, leading to scalability problems and drawing more power than needed from the smart objects' batteries. Preprogramming the recognition algorithms onto the sensor nodes may be another solution, but it needlessly restricts the breadth of applications for which the smart objects can be used. With the Titan framework, a scalable and composable deployment of the applications in pervasive environments is enabled. Below, we describe the implementation of the game and characterize it. The dice game service graph is composed at runtime by the application server and involves only the dice that are available on the schoolyard at the moment (see Figure 6). Illustration of the four Farkle game states, including the user action (top), the acceleration signals recorded on two dice for one throw (middle), and the individual service graphs for each game state (bottom). Every service is customized for the Farkle game state, as shown on the example of a decision tree service. The activity recognition part of the game is represented by service graphs which are executed in a distributed manner in the network. Within the same game, four unique service graphs are designed to recognize one of the game states: dice pickup, shaking, throwing, and scoring. While this could be realized by a single service graph, by using multiple service graphs we capitalize on the dynamic reconfiguration capability of Titan to minimize the number of resources used at any time point in the activity recognition process. Reducing the number of resources used for activity recognition is a key to enhance the sensor network operating time . The core logic of the Farkle game is a downloadable service in Java that is run on the mobile phone (Farkle game service). It receives the output of the service graphs, keeps the game scores and player sequences, and instructs the network manager which service graph to load next (i.e., when a dice is thrown, the next instantiated service graph is the one doing scoring). When the game is started by the players, the network manager on the mobile phone starts the Farkle game control service, which in turn instructs the network manager to map and execute the first service graph on the smart objects according to the mechanisms described before. The Titan framework then takes care of service instantiation and that data generated by one service is delivered to the next service according to the specification of the service graph. This occurs transparently, such that individual services are not aware of whether the next service is executed locally or the data first has to be transmitted to another smart object. The Farkle control service receives the results of the service graphs running on the smart objects and decides when the game progresses from one state to the next. When this occurs, it instructs the network manager to exchange the current service graph for a new one. During the execution of the service graph, the network manager monitors the network to determine whether problems occur. In case a node fails, it may issue a new mapping of the service graph and update the participating smart objects' configurations. Ideally, the Titan nodes recognize individually what is happening to them. Thus, data acquisition, segmentation, feature extraction, and classification are completed on the smart objects and wristband for the local sensing modalities. By only communicating their perceived context, the communicated data volume is reduced. A network classifier can fuse those reports to get a global view of the situation (see, e.g., ). The Titan nodes in the Farkle game feature three axis acceleration sensors integrated into the dice and in the children's wristbands. Those acceleration sensors are used to determine the four states of a player's throw: picking up the dice, shaking them, rolling, and determining their score. For each of the states, the Farkle game control service adapts the executed service graphs, such that only the wrist sensors and the dice that have been picked up are used. All nodes sample the data at 20 Hz and process the data locally as explained below. The game is decomposed in four different stages. In each stage, service graphs on the Titan nodes perform local sensor data processing and notify the Farkle game service of relevant events, such as the completion of a stage. The Farkle game service then reconfigures the service graphs on the Titan nodes to enter the next stage. Here, each stage corresponds to a different activity recognition task. Figure 6 illustrates the game stages, the service graphs mapped on the sensor nodes when a player chooses to throw two dice, and the corresponding service graphs executed on the smart objects and on the wristband. The first game state configures the wrist sensor of the current player to determine whether the player reaches down to pick up a dice. This event is broadcasted to the smart dice. The smart dice periodically sample their acceleration sensors using an acceleration service to detect whether they are moved by a variance and threshold service. The decision tree service shown in Figure 6 runs on the smart dice and reports to the mobile phone when the pickup and moving events coincide. Correlation between the pickup movement and the movement of the dice indicates which player has picked up the dice. The indication of who has picked up the dice is sent to the Farkle game service. This information is used to monitor that the game rules are appropriately followed. If the wrong player picks up the dice, a message is displayed on the screen and the application asks the players to restart the turn by throwing the dice anew. If the right player has picked up the dice, the Farkle game service reconfigures the Titan nodes with the service graphs to recognize the next activities. The second state of the game determines whether the dice are jointly shaken by the same player, allowing multiple people to play simultaneously. Only the dice shaken together with a player's wrist are used to follow that player's score. This detection is realized by computing variance and zero crossing rate of the acceleration on the dice and player's wrist, and classifying this into a binary decision indicating whether a specific dice is shaken by a specific person. This is notified to the Farkle game service. The third state waits for the end of the rolling motion of the dice. This is done by extracting the variance of the acceleration signal within a window (a measure of the energy of the acceleration related to the movement of the dice). A comparison to a trained threshold indicates whether the dice is moving or has stopped. Once the dice reaches a standstill, the Farkle game service is notified. The final state determines the eye counts of the dice from the measured gravity vector. The corresponding eye count is forwarded to the Farkle game service, which determines the throw's best scoring combination and identifies which player's throw is next. The state sequence then starts anew. The recognition of the eye count uses a decision tree classifier as well. It classifies the static acceleration sensed by the Titan node in the dice into a set of 6 output classes corresponding to the eye count. The classification result is sent to the Farkle game service. We have implemented the complete Farkle game presented above including an application server, a network manager on a mobile phone, six dice with integrated wireless sensors, and a wrist worn wireless sensor. We evaluated the performance of the Titan framework in terms of resource use, reconfiguration times, transmitted data volume, and context recognition accuracy. We have used an HTC P3600 mobile phone featuring a Samsung SC32442A processor at 400 MHz with 64 MB RAM to run a Java implementation of the Titan network manager, service directory, and to download and run the Farkle game control service. The six dice devices measured acceleration using an ADXL330 3-axis MEMS accelerometer sampled by a TI MSP430F1611 microcontroller running at 8 MHz and providing 10 kB RAM. The wireless link was provided by a Chipcon CC2420 transceiver implementing IEEE 802.15.4. The mobile phone connected to the smart objects uses a custom Bluetooth to IEEE 802.15.4 gateway. Downloading the Farkle game description including the Farkle game control service and the service graphs from the application server via HTTP required 38.9 kB of data transfer. In our office, it took on average 17 seconds to obtain it using an HSDPA connection. The reconfiguration time of a single node has been measured using a minimal service graph involving a counter and an LED display service. This service graph is encoded in 20 bytes and fits into a single configuration message. The resulting reconfiguration time averages at 106 ms and involves the transfer of a configuration message from the mobile phone over the gateway to the smart object, reconfiguration, and a confirmation message in return. Reconfiguring the node itself takes 650  . The execution times of individual services on smart objects range between a few microseconds and several milliseconds (see Section 4.3 for details for individual services). The most complex service graph of the Farkle game involves 41 services to recognize "shaking" for all 6 dice. Mapping it to the BAN takes 3.5 seconds while the complete switching time including wireless reconfiguration amounts to 4.4 seconds. Titan's reconfiguration time is short enough to be useful for user interaction applications. The recognition algorithms can focus on the few activities of interest in the current state and reconfigure for other activities when the state changes. The activities that should be recognizable after reconfiguration need to be detectable for longer than the reconfiguration time of the new service graph, which is in Farkle a maximum of 4.4 seconds. We characterize the most difficult activity recognition state of the game: "shake dice," (performance of Stages 3 and 4 is close to perfect as they consist of significantly simpler classification services). In the "shake dice" the wrist sensor and all dice picked up in the previous state sample their accelerometer at 20 Hz and detect correlated shaking. The data is segmented in 3-second windows with an overlap of 50 samples. Three features, mean, variance, and zero crossing rate are computed on the magnitude of the 3-axis acceleration. One dice sends its three features once per window to all other participating dice. Each dice then combines the received data to their own locally computed features into a feature vector that is classified with a decision tree to determine common motion. Executing the service graph on the MSP430 takes 4.88 ms after each sample, and 7.44 ms for feature calculation and classification when a window is complete. Using a dataset of 99 minutes of correlated and uncorrelated shaking of different frequency and amplitudes by five different subjects and performing a 5-fold crossvalidation, we reached an average accuracy of 83.8%. Better results were obtained using signal correlation as feature, which achieved an accuracy of 91.3. However, using correlation requires transmitting the complete 20 Hz magnitude data from the wrist to the dice instead of just transmitting three feature values every 2.5 seconds. It would thus increase the communicated data volume by a factor of about 10. A network classification using window features has also the advantage of needing less accurate synchronization between the sensors. In our tests, the shaking detection accuracy decreased by 12.8% when using correlation as feature and signals were misaligned by as few as 5 ms. For a similar misalignment, the window-based feature classification on the other hand decreased by only 0.1%. For dices, this amounts to a very significant reduction in data transfer. This significantly reduced bandwidth need enables the smart objects to use low-power communication with lower bandwidth as they only transmit events instead of continuous data streams. An important observation is here that using direct communication from the wrist to the dice reduces the required bandwidth by a factor of 2.3. This shows that a mesh topology here has an advantage over the usually chosen star topology for BAN. The efficiency of the distribution and execution of processing on the Titan nodes is key to the computational performance of Titan applications, given the limited capabilities of most sensor nodes. We have characterized in Tmote Sky motes  running at 4 MHz the low-level implementation of the Titan firmware. The characterization includes internal functions provided to services, some of the common signal processing services used for activity recognition, and node-level reconfiguration time (within a single Titan node). The implementations are compared (when available) to a plain TinyOS implementation, to the virtual machine Maté, and to the code distribution framework Deluge. The memory footprint of the implementation of Titan is listed in Table 1. While these numbers are specific to the platform we used, they provide an indication of the relative size of the Titan implementation compared to other systems. Memory footprints (bytes) in the Tmote Sky sensor node. The Tmote Sky module provides 48 k ROM and 10 k RAM. *As distributed with Tmote Sky modules, and instantiating the Main, TimerC, GenericComm, LedsC, and ADCC components. The space reserved for dynamic and packet memory RAM can be tailored to the needs of the application and the resources on the node. The service number and type in the service pool on the node determines the amount of ROM memory requirement and can be adapted to the platform as well. The memory footprint shown in Table 1 includes all Titan services as listed in Table 3. Table 2 lists the execution time for the most important functions Titan offers to the services. All times have been measured by toggling a pin of the microcontroller on the Tmote Sky. The average packet transfer is measured from the point where the sending service calls the sending function to the time where the receiving service has retrieved the packet and is ready to process its contents. This time is roughly . For the recognition of movements, acceleration data is usually sampled at less than 100 Hz , which leaves the services enough time for processing. Cycle count of the most important titan interface functions. Titan service set and execution time on a Tmote Sky. RAM indicates the number of dynamic memory bytes allocated, and ROM is the bytes of code memory used. The delay has been computed for a packet of 22 bytes data. gives memory bytes needed to store in the data type used, for example, for 16 bit values . Table 3 shows some of the currently available services for Titan. The execution times given in the table indicate how long each service needs to process a data packet of 24 bytes, which is the recommended Titan packet size as mentioned in Section 3.2.5.
where is the time needed by the sensor to sample one sample, and is the time needed to issue a packet. In a heterogeneous network, the times needed to execute a service differ from node to node, such that an adaption of the times is needed. This can be done by a simple factor as proposed in , where every node indicates a speed grade that is multiplied with the service execution time. A more exact approach would be to store a service execution time table on every node, which the service manager uses to determine whether the assigned service network is actually executable. To analyze the time of a reconfiguration, we have configured a node with a service subgraph containing a counter service that increments every second and sends its data to the LED service, which shows the counter value on the Tmote's LEDs. The service subgraph description has a size of 19 bytes and fits in a single configuration message. Table 4 shows times needed from the reception of the configuration message to the point where the service subgraph runs. The reconfiguration time of a single node is negligible compared to the download and mapping times of a Pervasive App. Using cached mappings, the reconfiguration times of service graphs can be reduced to within a second, which allows for dynamic exchange of network processing for different Pervasive App states. Analysis of the reconfiguration process comparing the node level timings to the application instantiation results of Section 4.2.1. If a reconfiguration needs multiple configuration messages, Titan stops the current service subgraph on the reception of the first message. The configuration of the new service subgraph is then continued every time new configuration packets are received. As soon as the service subgraph information is complete, Titan starts the execution and notifies the network manager of that fact. The continuous processing of the incoming configuration messages reduces the delay after the reception of the last message, as it only includes the configuration and startup time. To compare the Titan firmware on sensor nodes to other systems, we have benchmarked a test application in three systems: Titan, Maté , and Deluge . Thus, the comparison involves a virtual machine and a native code solution next to Titan's service-based approach. The test application continuously samples a sensor at 10 Hz, calculates the maximum, the minimum, and the mean over 10 samples, and sends them to another node (As such, the test application implements a typical processing structure found in accelerometer-based activity recognition system before classification: sensor data acquisition, feature extraction, and windowing.). We report the number and total size of the configuration messages to be sent (Table 5) and evaluated how long the processing of the samples takes on the node (Table 5). Characteristics of a simple configuration for sampling, feature processing, and sending for different platforms. Titan executes 6.5 times faster than the Maté virtual machine and has a similar configuration size. Deluge on the other hand has an application-specific image and is about 18x faster than Titan, but, due to the large number of configuration messages, it needs several seconds for transferring a program image and reboot. This time is not acceptable in the context recognition applications that we envision, where sensors, computational power, and communication channels may change dynamically and in unpredictable ways depending on the user location, motion, social interaction, and so forth. Deluge does allow to store a certain number of configurations, depending on the node Flash memory, but this allows only a small number of different task sets to execute, while Titan can be reconfigured to a much broader range of applications. Note that we have chosen a simple application capable of running on Maté. Maté is not able to support sampling rates higher than 10 Hz. It neither can compute an FFT at 10 Hz in realtime, which Titan is able to do. Being able to compute an FFT in realtime is important as many features for activity recognition are gained from the frequency space [7, 49]. In the future, ambient intelligence environment will see a large range of wireless nodes (see Section 1 where we make a case for this). In this discussion, we assume that they contain the Titan firmware and thus are Titan nodes. Some of these Titan nodes contain sensors. These are either dedicated for activity awareness—typically found in smart homes—but they may also be deployed for another primary reason, yet they can be repurposed to infer human activities. A sensor purposed for lighting control (e.g., a presence sensor or a light switch) may also provide the information about light toggling as a sensing service to the rest of the system. Other nodes are processing nodes offering computational services. Typically a sensor node also includes computational services. However, computational services and sensing services need not be collocated. Devices that have sufficient idle computational power may offer computational services to the system. For instance, a Bluetooth headset may provide computational services related to signal and audio processing while it is idle, then it reclaims these resources upon the reception of a call. The availability of computational and sensing services changes as the user changes location, picks up or leaves objects behind, or changes clothing—all potentially including elements of ambient intelligence. The resulting availability of services in the user's PAN is thus hard to predict at design time. We refer to such environments as offering opportunistic sensor configurations . Titan is essentially a programming model and a new way to deploy activity-aware Pervasive Apps in dynamic and heterogeneous environments at run time. We argue that Titan is well equipped to handle changing availability of processing resources (Section 5.1). However, Titan per se does not contain built-in mechanisms to deal with changing availability of sensors to perform activity recognition. This is an aspect that cannot be addressed solely by a programming model and run-time engine. It must be considered from a signal processing and machine learning perspective also. 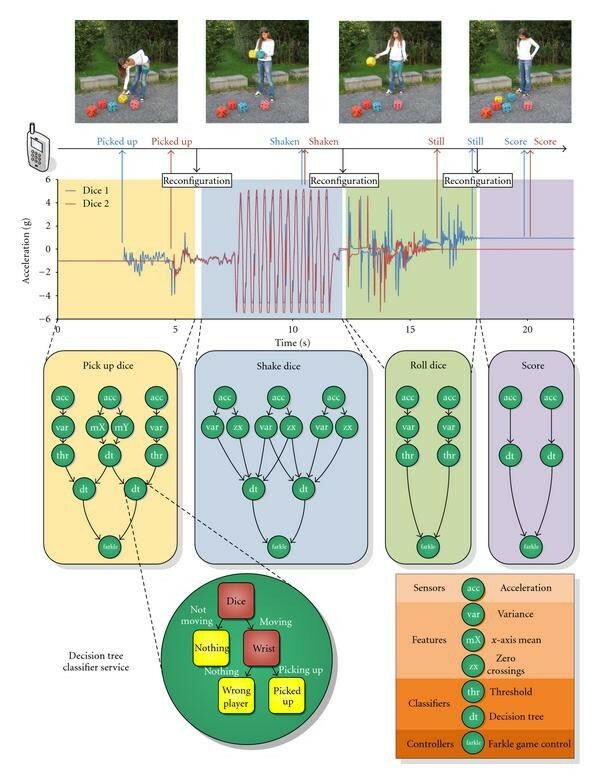 We discuss in Section 5.2 new signal processing and machine learning techniques developed by our group and others which aim at addressing some aspects of activity recognition with changing availability of sensors. We show that the design of Titan allows for the inclusion of such techniques into an activity-aware system. Combining these techniques with Titan further supports our objective of deploying activity-aware Pervasive Apps in real-world open-ended environments. Titan is equipped with several features to cope with opportunistic availability of processing nodes. In particular, it allows the application developer to focus on the logic of the application by describing an activity recognition process as a sequence of interconnected service graphs at design time. The mapping of the service graph to effective hardware resources is left to the run time and is handled by Titan. Thus, the application developer does not need to care about where specific computational services will be located at run time (he can, however, provide constraints if needed, such as when low latency is required between processing elements, e.g., to compute a correlation between data streams). A first mechanism lies in the network manager which maps the service graph it has been assigned to the available resources while minimizing a cost function. Since the communication between services is handled transparently, there is great flexibility for the network manager to deploy the service graph on the available nodes. In particular, services providing computation can be very easily and transparently moved across nodes. When processing nodes disappear (e.g., if the energy runs out, or the user moves away from the resource), Titan can seamlessly map the service graph to the remaining available resources. When new processing node appears, Titan can remap the service graph to minimize the cost of the implementation. Beside saving costs, a fast reconfiguration can also be exploited to virtually extend available resources by, for example, always only recognizing activities that are possible at the moment and thus increasing the total number of activities that can be recognized . Another mechanism lies in the Internet application repositories. The application servers contain application templates. They also hold sets of replacement services. When one service is not available, it can be replaced by one or more other services to reach the same desired function. For instance, a service based on an FFT to compute the dominant frequency in a signal (e.g., to detect walking) could be substituted by a lower-complexity mean crossing rate service. Foreseeing replacement services is currently left to the application developer which does this at design time. the sets of sensors envisioned at design time must all remain available at run time, and at the same location. These assumptions are not valid in opportunistic sensor configurations . Taking the example of an acceleration sensor, here are a few of the issues that may arise. A sensor placed on the upper arm in a wristband is used to detect gestures. With repeated gestures, the wristband may change place, or the user may even move it himself for comfort reason. The sensor signal patterns corresponding to the activities of interest become different after displacement compared to the design-time recording. This issue also arises with textile-integrated sensors in loose fitting garments . A sensor placed on the hip (e.g., in a belt buckle) for walking detection may be unavailable as the user has decided to change clothing. However, another sensor placed in a shoe becomes available and could offer comparative capabilities. Besides displacement, the orientation of the sensor may also change; a mobile phone may in a variety of pockets and be in various orientation in them. A sensor modality (e.g., acceleration sensor) may not be available at the desired location (e.g., arm). However, another modality (e.g., gyroscope) is available. As batteries get depleted or sensors regain energy through scavenging, sensors may appear and disappear over time in unpredictable ways. This leads to dynamic ensembles of sensors which need to be managed to perform activity recognition in an efficient manner. We describe below new signal processing and machine learning techniques developed by our group and others which aim at addressing some of these aspects and which can be included within Titan. Principles underlying these developments are discussed in  with a summary of other methods not discussed here available in . We developed an unsupervised classifier self-calibration technique which we showed can improve the resilience to small changes in on-body sensor placement of activity recognition techniques . This is applicable to any sensor modality. It only assumes that when a sensor is displaced the structure of the activities in the feature space retains a similar relative topological organization and that the class displacement in the feature space remains comparable to the interclass separation. As such, this approach is suited to small displacements on body segments (e.g., arms or legs). This approach is also suited to cope with changing sensor characteristic (e.g., sensitivity or offset, typical in sensors included in textile fibers), or to changing user action-motor patterns (e.g., due to aging). Within Titan, the application service repositories may automatically instantiate an unsupervised classifier self-calibration service when the application designer indicates that a requested sensor may be subject to displacement. Kunze and Lukowicz have shown that features that are robust to displacement can be designed using body models and combining accelerometer and gyroscope modalities . Within Titan, the application service repositories may automatically instantiate the computation of robust features when the service directory reports the availability of the necessary modalities. This may happen transparently, even though the application developer only specifies the use of an acceleration sensor in his application template. Kunze et al. have developed a method that allows for acceleration sensor to self-characterize their on-body placement  and orientation  using machine learning techniques. They also show that symbolic location in the environment can be obtained by similar self-characterization . Within Titan, we envision that Titan nodes geared for on-body use (e.g., mobile phone that can be in various pockets or belt clip, watch which may be on the left or right arm or in a pocket) autonomously determine their on-body location and orientation using these methods and report this upon service discovery queries as a self-characterization parameter. Thus, the service directory receives the notification of a presence of a sensor and additional self-characterization. The Internet application repositories may then instantiate an appropriate activity recognition service graphs according to the availability and placement of the sensors. The application designer would design various service graphs for the possible foreseen on-body placement of the sensors. For instance, walking can be detected from sensors placed at the hip or at the ankle with a similar recognition algorithm. The difference between the sensor placement translates, however, in different threshold parameters of the classification algorithm  which can be offered as different services. Kunze et al. have shown that a sensor modality (magnetic field sensor) can be replaced by another modality (gyroscope) . Calatroni et al. argue that there is a large number of modality replacements that can be envisioned in ambient intelligence environments . They suggest that many sensors can be repurposed for activity recognition even though they were initially provided for other uses. They characterize, for instance, how reed switches placed in windows for security purposes can be used to infer standing or walking, by means of assumptions about human behavior when interacting with these objects. They further propose a method of transfer learning to capitalize on such sporadic information gathered when the user interacts with the environment to acquire ground truth labels that can be used to train existing on-body sensors into recognizing these activities . Thus, while initially walking or standing could only be inferred during a short period of time around the interaction with the environment, after transfer learning to an on-body sensor, the capability to infer walking or standing is continuously available. Such an approach is especially interesting when the modality, placement, and orientation of the sensor on-body is unknown to the system. Transfer learning allows to attribute meaning to the signals of that sensor at run time. Thus, this method can in principle be applied to any known and yet-to-be-developed sensor modalities. Within Titan, the application server can autonomously propose alternative service graphs and the corresponding supplementary processing to exploit alternative sensor modalities (e.g., replace magnetic field sensor by a gyroscope). When Pervasive Apps operate over longer period of time, transfer learning can be exploited to attribute meaning to signals originating from unknown new sensors. This can be realized by means of a developer-generated database on the Internet repository side containing the behavioral assumptions, and the corresponding methods to operate transfer learning to a new sensor. Modern activity recognition systems are usually multimodal and capitalize on a wide availability of resources . When a large number of multimodal sensors are available in the environment, a common way to perform activity recognition is to rely on the global decision fusion of individual classification performed on the sensor nodes (ensemble classifiers ). We showed that enlarging the number of sensors contributing to the global decision rapidly enhances the activity recognition accuracy of the system . However, it also increases overall energy use. Since wireless sensor nodes are generally battery operated and rely on energy scavenging, a better approach consists of managing a power-performance tradeoff of the system. We have showed empirical heuristics to dynamically shape ensemble of nodes to reach a dynamic power-performance tradeoff, specified either in terms of target activity recognition accuracy, or network lifetime . The key of this approach is the heuristic that allows to find which sensors (one or more) should be included in the dynamic sensor ensemble to replace the loss of another one. Within Titan, we envision that the application developer characterizes the contributions of the various sensors foreseen for activity recognition, as described in . Based on this, the Internet application server may instantiate the Pervasive App template with various subsets of the available sensing services, in order to realize power-performance management. This also can lead to improved robustness to faults, as the loss of a sensor leads then to the use of a sufficient number of other additional sensing services to replace its contribution and maintain the desired target performance. Our vision with Titan is to enable Pervasive Apps—activity-aware applications that can easily be downloaded from Pervasive Appstores, much like the current trend with software Apps for mobile phones. The additional complexity of Pervasive Apps is that a hardware component is needed; sensor nodes on the body, in objects, and in the environment must all be recruited to support activity and context awareness. In a true pervasive experience, nodes may also provide feedback to the user (e.g., by vibrating on the body when playing a sports game or highlighting objects in the environment). While in our work we used custom sensor nodes based on the commercial TmoteSky motes, in the future, we envision that many of these nodes are likely to come from manufacturers of components of ambient intelligence environments. The services provided by these nodes will be related to the function of the element of the ambient intelligence environment in which they are integrated. The service-oriented programming model of Titan supports interoperability across various hardware; it hides the underlying implementation and allows interoperability among heterogeneous resources as long as the services are compliant. Thus, the application developer can focus on designing the Pervasive Apps service graph, rather than developing lower level services. This is a further element that may democratize the development of Pervasive Apps. Today's ubiquity of mobile phones makes them perfect candidates to act as mediators between the pervasive computing world and the user. To application servers, they abstract their environment and receive applications adapted to the current situation. For the pervasive world, they manage the distributed application running on Titan nodes in their vicinity. By managing the processing locally, the application gains on scalability and has an improved reaction time. The mobile phone screen may be used as user interface to display application status information, such as the game scores of Pervasive Farkle. However, with Pervasive Apps most user interaction can take place in the physical world. Compared to methods based on dynamic code upload (e.g., Deluge) or those based on virtual machines (e.g., Maté), the strength of Titan's service-oriented approach is that algorithms within the services are implemented as native code and are part of the node firmware (services currently cannot be updated, except on the mobile device). Thus, services can execute at close to native code speed, in contrast to virtual machine approaches. Yet reconfiguration remains fast as the configuration information only contains the service graph description, in contrast to dynamic code upload approaches. The flexibility of quick reconfiguration and the resulting possibility to adapt to dynamic environments is maintained. One major strength of Titan compared to approaches reviewed in Section 2 is Titan's seamless mapping of a design-time-defined service graph onto run-time-discovered available resources. We showed that this allows to cope with changing availability of processing nodes. It also allows to split applications into different states in which the Titan nodes only process signals relevant at the time. On state changes, when Titan nodes fail or get out of reach, the Titan nodes can be reconfigured to perform a new functionality. As a consequence, the computational load on the nodes can be kept low, and they can be switched off at times to save power. The application designer must currently foresee multiple service graphs if the Pervasive App is to be able to use various run-time-discovered sensor configurations for activity recognition. We outlined in Section 5 that novel opportunistic activity recognition methodologies (e.g., those explored in the centralized opportunity framework) may also be included in the logic of Titan to allow it to autonomously exploit dynamically discovered sensing services, in addition to the current dynamic use of processing services. Thus, this may allow Titan to perform activity recognition in changing sensor configurations by, for instance, substituting a sensor modality by one or more others. We showed that the rules governing such methodologies can be included within Titan, typically in the Internet application repositories. We are currently integrating the Titan framework into the SENSEI system which defines standards for accessing, describing, and composing services in a globally connected network of thousands of sensors, actuators, and processing units. Titan provides dynamic mechanisms allowing autonomous management and control of local nodes. Titan is agnostic to the underlying networking protocols. We used here 802.15.4 radios with the TinyOS communication protocol. However, Zigbee or ANT may also be used. Star networks, such as Bluetooth, can also be used, albeit limiting the flexibility in using larger number of sensor nodes for activity recognition. We want to enable Pervasive Apps—activity-aware applications that can easily be downloaded from Pervasive Appstores, much like the current trend with software Apps for mobile phones. We have discussed the challenges involved in realizing this in opportunistic PANs; PANs within which the available resources (sensors, processing elements) are changing over time in hard-to-predict ways. This occurs in open-ended environments as the user changes sensor-enabled clothing, takes and leaves devices behind, or changes location. The Titan framework has been proposed to enable pervasive applications in opportunistic PANs. The Titan framework is a service-oriented approach to the design, programming, deployment, and execution of activity-aware applications. An application is described by a set of graphs of interconnected services. It is downloaded by a mobile device from Internet application repositories. The mobile device maps the individual services at runtime to individual nodes of a heterogeneous sensor network and locally handles changes. titan is geared to streaming data processing and machine learning, which are typically used to realize activity recognition service graphs to be run within the network on and around the body. Custom services can be downloaded to realize the core logic of Pervasive Apps. We have described and characterized the implementation of a pervasive gaming application using Titan, a pervasive Farkle game relying on Titan nodes containing acceleration sensors placed on body and in smart dice. The results of the implementation show that a complete application can be ready to run in 17 seconds on a 3G network, including application download, computation of the service graph mapping for 7 sensor nodes, and node reconfiguration. The reconfiguration of a single sensor node takes less than 1 ms. Sampling rates of 100 Hz can be supported with enough free processing time for recognition algorithms. Thus, Titan offers a better tradeoff between processing time and dynamic reconfiguration delay than related approaches. Titan is well equipped to replace and remap at run-time service graphs containing processing services. We have extensively discussed how novel machine learning methodologies to perform activity recognition with unpredictable availability of sensors can be included within Titan to provide it with even more flexibility by allowing substitution of sensor modalities or including mechanisms to cope with sensor displacement. This is the object of ongoing work. During university lectures, freshmen developed simple Titan applications within a few hours time. Our experience outlines that the service-oriented approach of Titan may be a key to democratize the development and distribution of activity-aware pervasive computing application and eventually giving them the same ease of development and visibility as Apps currently developed for mobile phones. Titan is available under the GNU LGPL license from http://code.google.com/p/titan/. The authors acknowledge the financial support of the Seventh Framework Programme for Research of the European Commission, under the project OPPORTUNITY with Grant no. 225938 and the project SENSEI with Grant no. 215923.